improve my standings this season. is happily pointing out to me I have far exceeded that mark. their confidence, knowledge and constant encouragement! My name is Doris Locklear. I began working-out with Prescription Fitness on Dec. 1, 2009. How do I know the exact date? Because that day changed my life. I was introduced to Joe Butler through my son who is a wrestler on Joe’s wrestling team. I was 45 yrs. old and had just been diagnosed with Type II diabetes. I have a family history of heart disease, I was overweight, I was on several medications and wanted to avoid taking insulin. There was no better time to ask Joe if he and his staff at Prescription Fitness could help me. I began working out twice a week. This was hard, but Joe’s positive attitude and motivating personality kept me wanting more. He had me journal my food every day and suggested seeing my dietician on a regular basis. This type of team approach was amazing. By August of 2010 I had lost 30lbs and was on my way. Little by little I was getting stronger and feeling better. Joe no longer had to help me off the floor! I am inspired and cheered on when I am greeted by any member of the staff at Prescription Fitness. The pats on the back are encouraging and keep me focused on the big picture. I am proud to say that I’ve lost 100lbs. to date, I am not on insulin, I am off of several medications, I eat healthier and look great. My family is proud and I am now able to enjoy much more in life than ever thought possible. I came to Prescription Fitness late July 2010 in search of adding mass and muscle to my 6’4″ frame. When I started the program, I weighed 185 lbs. and had tried several programs before going to Prescription Fitness but never noticed results from any of them. I had heard about Prescription-Fitness through other athletes in the area that have trained with them and have achieved excellent results. I was very willing to work several days a week and put forth the effort to achieve the results that I wanted. I was put on a 4-day program with their trainers and also managed my food intake, which is another part of their program. I began seeing results in the first 2 weeks after my start in the program and was happy that progress showed from my efforts. I have been continuously going in for workouts since I started and now steadily weigh 220 lbs. in March 2011, as well as reducing my body fat. I now look to start the high school baseball season for Padua Franciscan HS and perform as one of the top players in the Northeast Ohio area and will continue to play baseball at the Division I college level at James Madison University in Virginia. I am so appreciative of the help from the staff as an addition to my efforts because at Prescription Fitness, both sides work hard for the client’s goals. The most rewarding thing I have done for myself this past year was to contact Joe Butler at Prescription Fitness in Bay Village. I have never worked with a personal trainer and was scared to death to make that first step, but Joe and his staff were incredible. I am a stay at home mom of three kids, was overweight and exhausted all the time. I knew I had to do something! Working with Joe and his staff has changed not only my physical appearance but my attitude as well. I have lost over 6o lbs. and am now working on sculpting my body. I couldn’t have done this journey without the support of my family, friends, Kim Rugan, the staff at Prescription Fitness and especially Joe Butler. My family has jumped onto he band wagon as well; my husband, son and daughter are all training with Joe and his staff. I am truly blessed to have the opportunity to work with an amazing group of people. As Joe always tells me “enjoy it”, and believe me I am! Prescription Fitness has provided my family and baseball athletes at St. Edward H.S. with personal attention to detail, calculated results, and proven training techniques second to none. Any individual or athlete trying to reach his or her maximum potential whether on the sports stage or just wanting to lose a little weight, better make Prescription Fitness their choice, it’s the best route to the top of your game. I was first introduced to Prescription Fitness when my son wanted to get an “edge” in baseball for St. Ed’s. 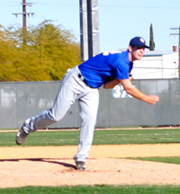 After two years with Joe and staff and great results, he is a D1 baseball recruit. My wife and I decided to work out with Joe too. In a very short time, we both have seen dramatic results: reduced weight reduced body fat %, and we have gotten much stronger. Joe and staff provide very personal attention and support not only in the gym, but outside as well. We have never had a better experience with a personal trainer as we have had with Prescription Fitness. So great in fact, that now our daughter has started training at Prescription Fitness to improve her chances as a freshman high school athlete. I have exercised regularly for many years without results. Joe’s knowledge of nutrition and strength training, combined with his motivational approach, have enabled me to significantly reduce body fat and add muscle. I just wish I met him sooner! There was only 12 weeks left ‘til the Musclemania Championships. I had to get to the next level and I knew I needed to make some changes. Joe mapped out a program that would take me to the top. It worked! As an athlete who plays high school football at St. Edward, I needed to improve on my playing abilities. Joe Butler said he could help. He spent the time needed to help me lose the weight, increase my lifting and implement speed drills. At the end of the first three weeks I noticed quite a difference. I am lighter, my endurance and lifts have increased and my speed and agility have greatly improved. I have gone from 285lbs to a healthier, leaner 267lbs. Joe has been there to reassure me and to keep pressing me towards my goal and reaching for the top! Thank you. Joe helped me realize the importance of weight training as part of weight loss. Im not on a strict diet but the pounds are coming off quickly. The encouragement of a trainer helps keep me on target and focused. By chance and luck, I met Joe Butler at the Hollywood Gym in Los Angeles. I was in contention for a lead in a new television series, had three months to prepare and needed to get in shape. My haphazard routine in the gym was not getting me the results I needed. In three months Joe educated me on the concepts of what to eat, how to supplement with nutrition, how to cut my sugars, and how to maximize my workouts. He kept me accountable to my goals & got me results. Joe’s enthusiasm, knowledge and zeal for health & fitness was contagious….resulting in the best shape of my life! Joe was my first ever personal trainer and the first person to not only enable the reaching of my fitness goals but was responsible for a newfound peace and confidence I didnt even know I needed! The best favor I have ever done for myself is get in touch with Joe Butler of Prescription Fitness. After signing up for the Body for Life contest, I had just 11 weeks to get into shape. I really wanted to win this contest. I found a flyer in the Subway Shop advertising a new fitness place in town and called there on a Saturday afternoon to make an appointment. Joe Butler came in to his gym to meet me the next day (a Sunday!) and we discussed my goals and the short period of time I had to achieve contest-winning results. We got started the next day. At the end of the 11 weeks the results were unbelievable. I dropped from a size 12 to a size 6, lost 17 pounds and regained vitality and good health. People in my life could not believe the change and comments came fast and furious. I didn’t win the international contest, but I did win much more. I won the chance to regain my youthful figure and believe in myself again. If I could put it into just a few short words Joe really knows what he is doing – and he does it very well. Let him get started with you today. It’s the best thing you will ever do for yourself.